Clearwater group rallies support for bill to ban mandatory child-drugging in schools nationwide. Top: At the 2003 state family physicians convention in Kissimmee, the Florida chapter of Citizens Commission on Human Rights (CCHR) provided doctors with special-interest-free information on the harm wreaked by the indiscriminate drugging of school children falsely diagnosed with Attention Deficit Hyperactivity Disorder. 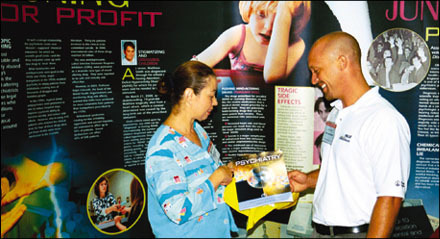 CCHR’s exhibit pulls no punches in exposing the profit-motivated campaigns that have popularized drugging of school children with amphetamine-like drugs — drugs so potent that they have led to the tragic deaths of youth like Matthew Smith, (above) who died of a heart attack in March 2000, as side effect of the psycho-stimulant he was given at his school. Imagine this scenario rolling out at your workplace: The boss calls you into his office and tells you that you have “disciplinary issues,” you talk too much and are a bad influence on the rest of the group. When you get upset, he says that it proves you have a mental illness, and that if you do not begin taking anti-depressants, you will be fired. Or, imagine you are at work sitting at your computer, working on a project that bores you when a new idea occurs to you about how to solve that nagging problem in accounting. You jump up and head over to talk your idea out to the people in the neighboring cubicles. Your boss sees you off your computer and says that you have a short attention span and that you are showing signs of Attention Deficit Disorder — ADD — and will have to take psychiatric drugs in order to keep your job. If you don’t, your chances for future employment will be marred by the “fact” that not only do you suffer from a mental illness but refuse treatment. If this sounds more like an outrageous violation of your most basic human rights, it most certainly is. You would probably fight and hire an attorney to protect your rights and your job. Unfortunately, our children do not always have that luxury and parents do not always have the option to fight. When faced with the words, “Put your child on this drug or he will be removed from school,” parents do not feel that they have a choice. On the fortunate side of the ledger Florida parents and children have an advocate in the state chapter of the Citizens Commission on Human Rights (CCHR) at 305 N. Fort Harrison in downtown Clearwater. What is at stake is no small matter: the right of parents to nurture their children in a way consistent with their religious and ethical beliefs and the right of children to grow up drug-free. Mary DeMoss, Executive Director of CCHR Florida, briefed hundreds of medical professionals on the dangers of indiscrimiately drugging children. The Universal Declaration of Human Rights states that “Parents have a prior right to choose the kind of education that shall be given.” However, this basic parental right is in danger, and has even more permanently devastating effects, as in the case of Matthew Smith. 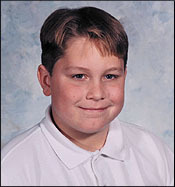 Matthew Smith was an active boy. Like most six-year-olds, he liked riding his bike, and playing softball. He also had a particular passion for building forts. However, as he progressed through first grade, “The school social worker kept calling us in for meetings, complaining that Matthew was ‘fidgeting’ and ‘easily distracted,’” his father, Larry, said. Matthew’s parents were then told that he had ADHD. “She told my wife and I that if we wouldn’t consider drugging our son, we could be charged for neglecting his educational and emotional needs,” Mr. Smith recalled. After also being told that the stimulant was safe and effective and that it could help, the Smiths acceded to the pressure. “If we hadn’t been pressured by the school system, Matthew would still be alive today,” says Mr. Smith. Stories like this compel CCHR’s leadership to expose and eradicate the coercive drugging of school children. In May of this year the U.S. House of Representatives responded by passing the “Child Medication Safety Act” of 2003 by the overwhelming margin of 425-1. If ratified by the Senate as written, school personnel would be legally prohibited from requiring that a child take any psychotropic (mind-altering) drug under the Controlled Substances Act as a condition of attending school or receiving school services. There is now a groundswell of support for this bill in the Senate. On July 10, 2003, Senator John Ensign introduced the legislation, saying that thousands of parents across the country are being forced to choose between medicating their children and removing them from school. “The decision to place a child on medication as a method to treat behavioral problems or learning disabilities should be made by parents and parents only, and undue influence or coercion by school officials has no place in such an important decision,” Ensign said. On the heels of Sen. Ensign’s announcement, CCHR launched its support of his initiative, stressing that the bill would eliminate drug coercion in schools and restore to parents their inherent right to make informed decisions affecting the health and educational needs of their children. Further, it permits teachers to get on with the job they are trained to do: teach. Subsequently, more 400 faxes from Florida residents have been sent via CCHR Florida to Senators Graham and Nelson urging their co-sponsorship and support of the bill. “Children are not dogs that can be programmed, but this is what the psychiatrist would have you think,” said CCHR Florida Director, Mary DeMoss. In order to educate the public, CCHR has produced a booklet, Documenting Psychiatry: Harming in the Name of Healthcare, which lays bare the track record of false solutions from psychiatry. This booklet, and other informative publications, are available from CCHR’s Florida office in Clearwater. Additionally, the web site www.fightforkids.com provides scientific evidence on the dangers of psychotropic drugs, safe alternatives to these drugs, and what parents can do to protect their right to parent and their children’s right to be a child. This website also contains a section on the stories of parents who have fought against drugging their children and who found the true causes behind their children’s behavior. For example, one family was at their wits end with their son’s argumentative behavior. Though originally prescribed a psychotropic drug to address his “hyperactivity,” the parents took him to a medical doctor for a full evaluation of the boy’s health. The medical evaluation revealed that their impulsive and inattentive son was actually dramatizing the symptoms of carbon monoxide poisoning caused by an ineffective heating system in the family home. This was quickly remedied by fixing the heating system. Shortly thereafter, the boy was back to doing well at school. 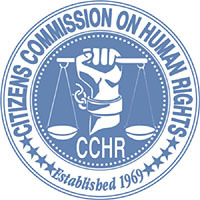 Further information on the Citizens Commission on Human Rights is also available on line at www.cchr.org. "Is CCHR part of the Church of Scientology?"